I haven't seen my friend Marti for a while. She's enduring the same kind of convalescence prison situation that I had a few months ago. But a few days ago, she put this on my profile: "Since I'm the Queen of Everything, shouldn't you make one that hobbles around smacking young people in their shins with her cane when then don't get out of the way? Of course she'd be muttering, "Young whippersnappers," or perhaps something a bit more graphic..."
Inspiration comes from marvelous and unexpected places, and her request resulted in yesterday's card and today's, and may wind up having enough legs to get me through the last two also. I realized that the cane could easily be the Pharaoh's crook, but what's a crook without a flail? So here, our goddess has both -- and uses them to wicked good purpose. 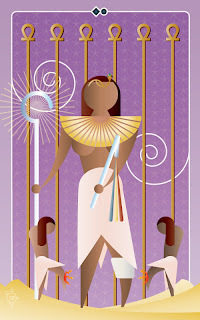 While this card isn't the Queen of Ankhs, if it comes up in your reading, you can call it the "Queen of Everything" card, or the "Whippersnapper" card, or -- and this is my preference -- the "Marti" card. Interpret it as "having aggressive wisdom," or in the reverse, "coming through, pipsqueak, get out of my way." Oh, and the Latin at the beginning of this ramble? "Fifty Shades of Marti."